Jacopo Carucci (May 24, 1494 – January 2, 1557), usually known as Jacopo da Pontormo, Jacopo Pontormo or simply Pontormo, was an Italian Mannerist painter of the Florentine School. His work represents a stylistic shift from the calm perspective regularity of the art of the Florentine Renaissance. He employed twining poses and ambiguous perspective. His figures seem to float in their environment. The Visitation which Pontormo completed in 1528 and now rests on the altar of a side chapel in a church, the Pieve di San Michele, in Carmignano a town west of Florence. The story for this painting is the visitation of the just pregnant Virgin Mary to her pregnant aged cousin Elisabeth, the wife of Zacharias. The subject of the painting is taken from Luke I. 40 where she entered the house of Zechariah and greeted Elizabeth. 42 cried out in a loud voice and said, “Most blessed are you among women, and blessed is the fruit of your womb". 43 "And how does this happen to me, that the mother of my Lord should come to me? 44 For at the moment the sound of your greeting reached my ears, the infant in my womb leaped for joy. The two figures in the painting with their linked arms form a lozenge shape. This intertwining of figures was one of Pontormo’s trademarks as was the way he makes the characters seem to almost float. The two main characters, Mary and Elizabeth, who are painted in profile, gracefully embrace as they exchange glances of mutual affection. They dominate the canvas as they stand on the threshold of Zacharias’s house or, in another view, the walls of Florence. The two other figures in the background seem quite unbending and statuesque as they look at something outside the picture. In the middle ground of the picture, on the left hand side, we can just make out two small figures seated on a wall. Above them is another small figure, a woman hanging a cloth out a window. Probably there are also social and political dimension to this painting. 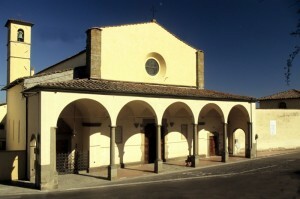 In 1522, when the plague broke out in Florence, Pontormo left for the Certosa del Galluzzo, a cloistered Carthusian monastery where the monks followed vows of silence. There he painted a series of frescoes, now quite damaged, on the passion and resurrection of Christ. 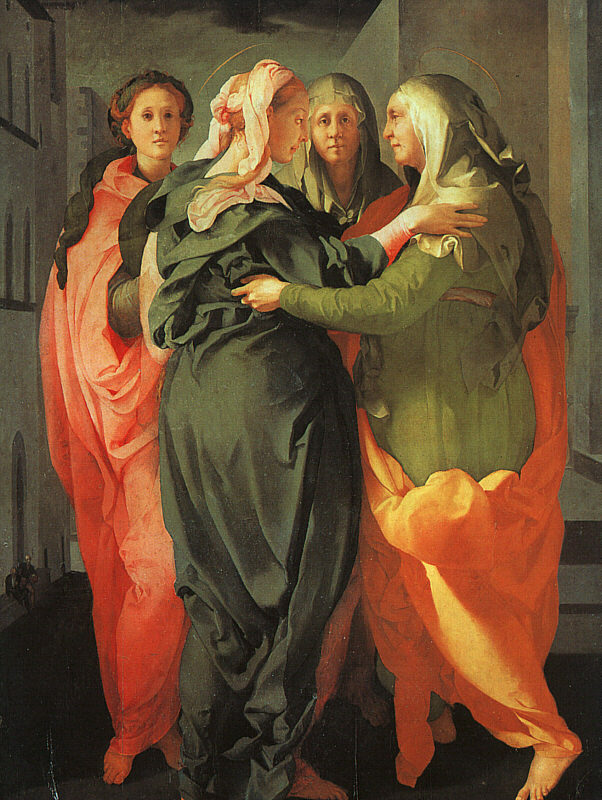 Pontormo painted The Visitation in the immediate aftermath of the Sack of Rome by the troops of Emperor Charles V, an event which sent shockwaves across Italy. The sack roused the citizens of Florence to turn against their Medici rulers and expel them and to once more declare the Florentine state a republic. At the height of the rebellion, Michelangelo, whose forms and vivid palette had influenced Pontormo, was living in the city. 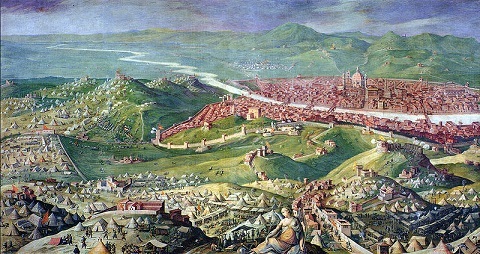 In his capacity as military engineer and architect, he fortified Florence against reprisals from the wounded papacy of the Medici Pope Clement VII. Crisis was in the air. The War of the League of Cognac (1526–30) was fought between the Habsburg dominions of Charles V (mainly Spain and the Holy Roman Empire) and the League of Cognac which included the Republic of Florence and the Papal States. Charles V gathered a force and advanced on Rome. The Papal armies, proved unable to resist them and when the Duke of Bourbon was killed, Charles's underpaid army sacked the city, forcing the Pope to flee. The looting of Rome, and the consequent removal of Clement from any real role in the war, prompted action on the part of the French. In April 1527, Henry VIII and Francis signed the Treaty of Westminster, pledging to combine their forces against Charles. Francis, having finally drawn Henry VIII into the League, seized much of the Genoese where it dug itself in for an extended siege. None the less it was ultimately defeated. As stated, the Florentines had thrown off Medici rule and established a republic after the sack of Rome in 1527; the Florentine Republic had continued to participate in the war on the side of the French. The French defeats at Naples in 1528 and at Landriano in 1529, however, led France to conclude the war with the Treaty of Cambrai with Charles V. When Pope Clement VII and the Republic of Venice also concluded treaties with the Emperor, Florence was left to fight alone. Charles, attempting to gain Clement's favor, ordered his armies to seize Florence and return the Medici to power. The Republic resisted this incursion; but, left without allies and betrayed by many of the mercenaries in her employ, Florence was unable to keep fighting. Eventually resistance became impractical, and the city surrendered in August 1530. The Medici returned to power and over the next few months, many of the Republic's leaders were executed or banished. Among those fleeing the city may have been the owners of The Visitation. Now back to the painting. 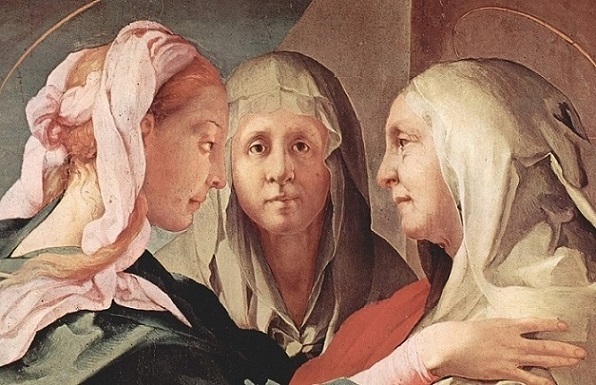 Pontormo depicted the subject in an original way, intensifying both the physical and emotional intimacy of the encounter between Mary and Elizabeth by almost filling his composition with their monumental, embracing forms. In ecclesiastical Latin "Visitatio" denotes not merely a visitation but "a procedure for becoming aware of something, for examining and experiencing something." The model of the embrace might have come from a slippage of meaning in the Greek word "aspasmos", which means a joyful, warm, and emphatic greeting. Like Giotto, two centuries earlier, Pontormo places the two figures outside and also with two other women in attendance. In the middle ground, seated on a low wall, a pair of attenuated, watching figures seem tiny by comparison, human ants observing momentous events from a distance. The foreground group is completed, perhaps, by the two sisters accorded to the Virgin Mary by late medieval legend, Mary Cleophas and Mary Salome. They look on with calmly beatific, contemplative faces. They seem in fact to look past Mary and Elizabeth and into the eyes of the viewer, as if to urge meditation on the sacred scene. As Mary and Elisabeth look deep into each other’s eyes with a subtle intensity, the charge of emotion that passes between them is palpable to the viewer. 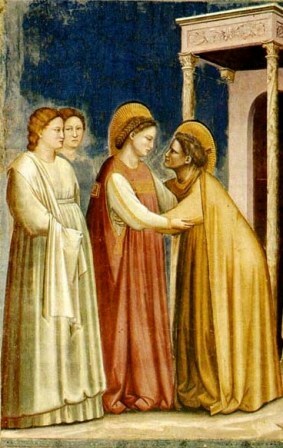 The theme of the Visitation, in which the young Mary greets the elderly Elisabeth, has traditionally symbolized the passage from Old Testament to New. But in Florence in the late 1520s, it may also have acquired a reformist significance. Many Florentines believed that the Sack of Rome was punishment meted out on a decadent Medici papacy, and felt that the time was ripe for the Church of Rome to heed the teachings of Erasmus and Luther and to renew itself in a different form. 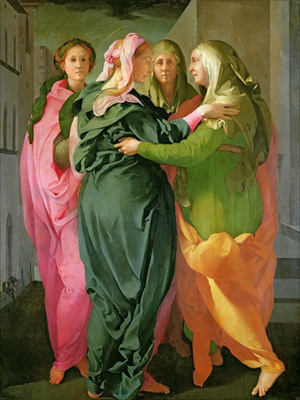 Pontormo’s Visitation may have been intended to give visual expression to such beliefs. The outdoor setting, and the proximity of the principal figures to a heavily fortified wall, seemingly somewhere in Florence, appears to create a link between the sacred subject matter and what was at stake at the time, a fight for the soul of the city. The fact that the picture is no longer to be found in Florence implies that possibility. Perhaps, when the Medici retook the city in August 1530, the owners of the painting fled to a nearby safe haven, taking this treasured possession with them. The four women seem to be only two women; two facing one another and the same two facing the viewer (examine the faces, the hair color, the dress). How do we interpret this? Interpretations are tricky and, like a Rorschach test, often reveal more about the interpreter than the painting. Here are a few and I invite you to take your pick. 1. The artist used the same model or cartoon, so the resemblance is due to taking a short-cut with the painting. 2. The two figures in the back ground are alter-egos of the two central figures, only younger. 3. As the Biblical meeting took place fifteen-hundred years before the painting and the painting is set in 16th century Florence, the artist is showing the timelessness of the subject. Moreover, "reading" from left to right, figure one is the future perfect tense, Mary represents the future tense, next comes the present tense, and Elisabeth the past tense. As we look at the painting today, we are five centuries removed from Portormo's time and, for now, we are the present tense. Thus, the two central figures float forever, suspended in the present, while the viewers slowly fade away. The painting now (10/2018) is on loan in New York. If you want a lecture by an expert on it click Here. Here is a link to to another Portorno painting.